The apartment, on the first floor, which also has an independent entrance from the garden gate, overlooks a large terrace facing the sea and is furnished with 19th century furniture and vintage geographic maps. At his entrance a large bronze Buddha from Mandalay in Myanmar looks at the patio, where orchids and azaleas bloom under secular trees. Here is a wrought-iron coffee table with two chairs where in the beautiful days you can have breakfast or eat. In the bedroom there are two bateau lit, one in a square and one half and one in a square, which can accommodate up to three people. There are two bathrooms: one large with whirlpool tub, and one smaller with large shower. There is a kitchenette with marble sink and a closet room. The floors are in granite and wood. In the garden, located on two levels, there is the patio of the orchids, a palm tree, three large pines, an olive tree and a Balinese corner with shower and shells set in the wall, where to shower on hot days. Guests have access to these spaces except for the studio, which is autonomous as it is accessed from the garden. It stays below the first floor. It is equipped with washing machine and washing machine. From here there is access to a large basement with sink. Liebevoll dekoriertes Appartement mit atemraubender 180 Grad Aussicht. Speziell gefallen hat uns der Garten wo man morgens bei aufgehender Sonne frühstücken oder abends einen guten Wein oder Whiskey geniessen kann. Die tolle Lage in Pieve Ligure eignet sich sehr gut für Wanderungen oder Velotouren nach Camogli und Portofino. Die Anfahrt aus der Schweiz (Bern) dauert via Grossem St. Bernhard nur 5 Autostunden. Mit etwas Glück findet man einen Parkplatz direkt unterhalb der Liegenschaft. Ospiti meravigliosi che hanno apprezzato la casa. Puntuali, attenti, precisi hanno lasciato la casa in perfetto ordine. Speriamo di averli presto ancora nostri ospiti. Wonderful apartment with fantastic view! In this apartment we slept three and it was perfect! Two luxury bathrooms and a small kitchen. 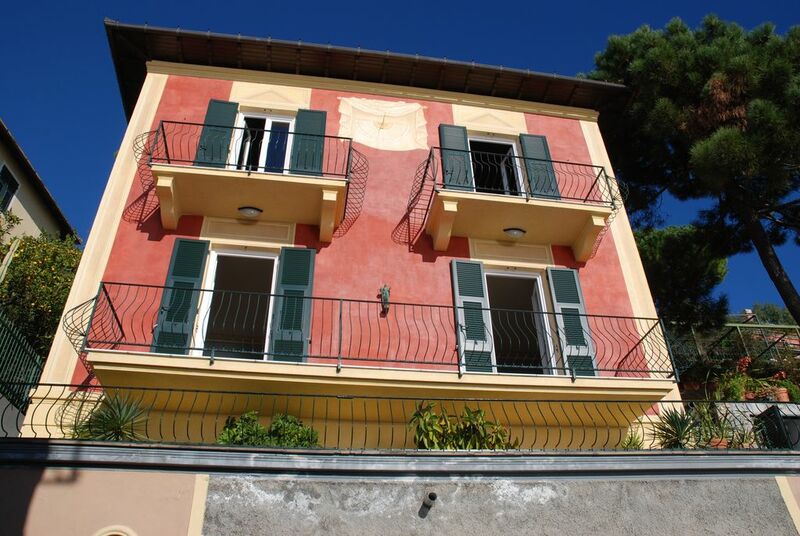 The garden and the balcony had a lovely view and walking distance to restaurants and beaches (in the nearby village nice beaches and in Pieve Ligure rocks). The landlords were fantastic and we got the best service! Cara Anna, grazie per le tue entusiastiche parole. Per noi è stato piacevole ospitarvi. Siete stati degli ospiti eprfetti. Speriamo che si rinnovi questa opportunità. La casa del viaggiatore concilia le meraviglie naturali della Liguria al fascino di un ambiente ricco di bellezza, storia e cultura. Il letto di Napoleone (così ribattezzato da nostra figlia) e il nostro "Amico Budda" rimarranno impressi nella nostra memoria insieme all'immensa distesa azzurra che si godeva dai nostri letti. Il valore aggiunto però è senz'altro il padrone di casa. Pietro è una persona squisita e disponibile che trasmette pace, serenità e cultura. Immergetevi nel fascino della Liguria e fermatevi alla Casa del viaggiatore...Vi conquisterà! Nel leggere le vostre affettuose parole quasi.. quasi arrossivo. Cosa che non mi capitava da molti.. moltissimi anni. E' stato un piacere ospitarvi e aver condiviso "Napoleone" e "Buddha " con voi e la vostra ineguagliabile bambina. Mi auguro che le vostre vie del mondo passino ancora per La Casa del Viaggiatore. Pietro est un hôte parfait, très gentil et très serviable. Les nuits sont calmes, climatisées si besoin, et "noires" car volets intérieurs en plus des volets persiennes. Seul petit reproche...peut être la largeur des lits qui mériteraient d’être en 160, mais ça fait partie du charme et de la décoration..
Nous avons passé 1 superbe séjour. there are several points very close to the house where you can swim in the sea. All within walking distance. Behind the house you can go hiking on trails that lead to very beautiful sights. A few kilometers away is the National Park of Monte di Portofino, natural oasis in which there are paths mumerosi escusionistici and the Abbey of San Fruttuoso (13th century) at sea level with beaches of incomparable beauty.